Born: December 30, 1935 in Kamsack, Sask. The Saskatchewan native is a two-time PGA Championship of Canada winner, capturing the title in 1965 and again in 1971. He represented Canada three times at the World Cup. Homenuik is currently the Senior Teaching Professional at Oakdale Golf & Country Club in Toronto. 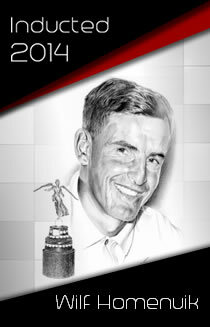 Wilf was inducted into the Canadian Golf Hall of Fame in 2005.